Somewhere, hidden amongst thorny brambles is a little kingdom of elves and fairies. Everyone who lives here is very, very small. The Little Kingdom is home to Princess Holly and her best friend Ben Elf. In 'Ben and Holly's Christmas', Father Christmas pays a surprise visit to The Little Kingdom to check on the Christmas preparations. Everything is going according to plan until the King gets trapped in a cracker, the Queen gets trapped i.. When a spell accidentally goes wrong, Ben and Holly grow to human size! Poor Gaston the ladybird has never had a birthday party, so King Thistle says it can be Gaston's birthday party. Springtime in the Little Kingdom brings out tulips, daffodils, hedgehogs... and two very hungry gnomes. Join Ben and Holly for lots of magical fun and exciting adventures in the Little Kingdom. Episodes: 1. Big Ben and Holly, 2. Mrs Witch's Spring Clean, ..
Lucy is having an Elf and Fairy Big People party and Ben and Holly go along too. But they get mistaken for toys and they can't help wanting to be part of the party. Ben, Holly, Captain Redbeard and Nanny Plum are off on a treasure hunt with Captain Squid's treasure map. Daisy and Poppy use King Thistle's magic wand to learn how to do magic it all goes bananas! Join Ben and Holly for lots of magical fun and exciting adventures in the Lit..
Somewhere, hidden amongst thorny brambles is a little kingdom of elves and fairies. Everyone who lives here is very, very small. The little kingdom is home to Princess Holly and her best friend Ben Elf. Holly is a young fairy who is still learning how to do magic properly. Ben is an elf and elves don't do magic, but they are very good at making things. Along with their friends, Ben and Holly have lots of magical fun and exciting adventu..
Own Ben & Hollys Little Kingdom - Planet Bong DVD from Deff, DVD, Blu-Ray & 4K Video Specialists - Free UK Delivery..
Somewhere, hidden amongst thorny brambles is a little kingdom of elves and fairies. Everyone who lives here is very, very small. The Little Kingdom is home to Princess Holly and her best friend Ben Elf. Holly is a young fairy who is still learning how to do magic properly. Ben is an elf and elves don’t do magic, but they are very good at making things. Along with their friends, Ben and Holly have lots of magical fun and exciting ad..
Own Ben & Hollys Little Kingdom - The Magic Collection DVD from Deff, DVD, Blu-Ray & 4K Video Specialists - Free UK Delivery..
Somewhere, hidden amongst thorny brambles is a little kingdom of elves and fairies. Everyone who lives here is very, very small. The little kingdom is home to Princess Holly and her best friend Ben Elf. Holly is a young fairy who is still learning how to do magic properly. Ben is an elf and elves don't do magic, but they are very good at making things. Along with their friends, Ben and Holly have lots of magical fun and exciting ad..
Somewhere, hidden amongst thorny brambles is a little kingdom of elves and fairies. Everyone who lives here is very,very small. The little kingdom is home to Princess Holly and her best friend Ben Elf. Holly is a young fairy who is still learning how to do magic properly. Ben is an elf and elves don't do magic, but they are very good at making things. 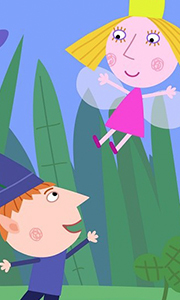 Along with their friends, Ben and Holly have lots of magical fun and exciting adv..